The project is named “Shiv Yog Cosmic Farming” and is designed by Dr Avadhoot Shivanand, a former chemical engineer turned godman, in Gurgaon through his Shiv Yog Foundation. Goa Agriculture Minister Vijay Sardesai with his wife Usha at an event in Fatorda. A “vedic” technique which requires a farmer to sit, meditate and channel “cosmic energy” by chanting “Om rom jum sah” for at least 20 minutes a day for better yields, got the backing of Goa Agriculture Minister Vijay Sardesai Tuesday after he inaugurated a pilot project at a field, close to his residence in Fatorda. The project is named “Shiv Yog Cosmic Farming” and is designed by Dr Avadhoot Shivanand, a former chemical engineer turned godman, in Gurgaon through his Shiv Yog Foundation. 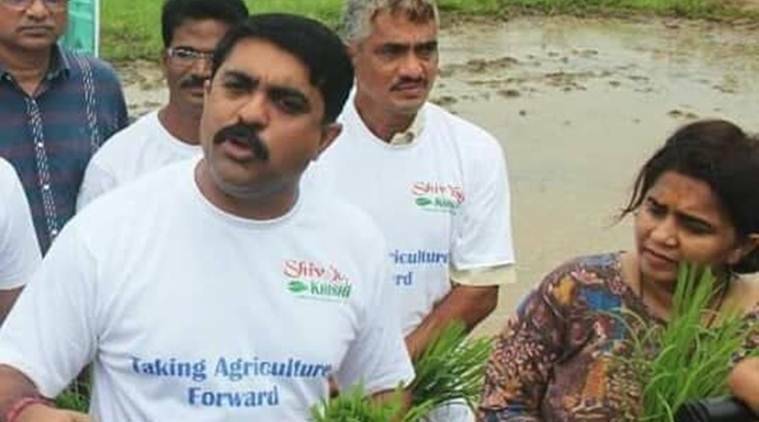 Sardesai’s wife, Usha is a follower of this foundation and “shakti” videos have gone viral among farmers across the state on social media. In January, Usha, accompanied by the Director of Agriculture Nelson Figueiredo, attended an hour-long workshop with Dr Shivanand, where they were told of the benefits of “channelling Shakti into the soil”. Figueiredo could not be reached for comment, but Sardesai confirmed the visit. Over the last week, Goan farmers have been receiving videos on WhatsApp, which claim they were shot in fields of Madhya Pradesh. The videos show farmers sitting cross-legged and meditating with Shivanand, called ‘Babaji’, describing the impact on the field. In one video, he calls it “tapping the cosmic shakti through the third eye similar to Lord Shiv and forcing the energy to dilute the negative destructive sounds around the field, pushing the universe’s positive vibrations towards healthier seed germination”. In another video, Shivanand speaks to a room full of “scientists and doctors” calling them referral points and says that the “third eye spiritual exercise” is a “science beyond science”. Shiv Yog Foundation could not be reached for comment. Agriculture Department officials said their role in the exercise is “limited” and they will only assist where needed, which includes identifying plots in the state which allow for alternative farming methods, and a promise that “no one will be forced to do it”. Farmers were also called in for a free two-day workshop at the state’s official stadium. In a presentation at the workshop, representatives of the Shiv Yog Foundation distributed a curriculum on meditation, which requires an at least 20-minute recital of “Om rom jum sah” during the seed planting stage, till the seeds take roots – to ensure the “cosmic energies bring the positive microorganisms alive”, and reduce the dependence on fertilisers, gradually. The participants were also asked to view a Doordarshan show by Dr Shivanand where he presents two studies that confirm his methodology. According to Sardesai, the studies were enough, though the state government hasn’t verified either of them. Fatorda farmers from Sardesai’s constituency who attended the exhibition, say Usha Sardesai’s case study was also discussed where she has practised the methodology on her plants at home, and her “orchids” on the front porch. “All I know is there are some celestial sounds one can capture and channel through mediation and help increase the yield and decrease the input of fertilisers. This particular scheme of Shiv Yogi also comes under the Paramparagat Krishi Vikas Yojana of the Central Government and hence we decided to look into it. The government’s thrust is to increase cultivation, now it can be done anyway, either using religion, through cosmic science, through glamour… anyway,” he said. “If you ask me, we have 40 thousand hectares of cultivable land lying fallow. If sitting and meditating and tapping cosmic sounds excite them and bring them to the fields, then that is enough for me,” said Sardesai.